In my mind spring truly arrives with the annual Lyrid meteor shower. This year, the oldest recorded meteor event (with records dating back 2,700 years) arrives April 16, but don’t get too excited until April 23 when Lyrid is expected to peak at 20 meteors an hour. Named for a radiant point near constellation Lyra, I always settle on Vega (my favorite summer star) as the source of Lyrid magic. In Northern hemispheres, Vega rises in the north-east sky around 9 or 10 pm. by midnight Vega shines high enough for meteors blazing across the sky to appear as her manifestation, higher still in the hours just before dawn – Vega stands as my Lyrid beacon. 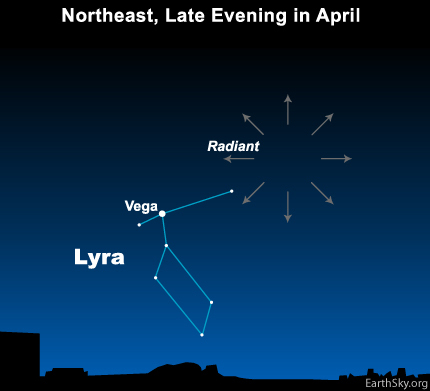 Don’t fret if Vega eludes you, Lyrids can appear at any point in the night sky. A spectacular peculiarity of Lyrid meteors – roughly a quarter of them leave gas trails behind, ionized gases that glow for a few seconds after a meteor passes. If fair weather and the spirit of Lyrid moves you – cast your gaze skyward in the morning hours of April 23.